Schlumberger's DIPMETER ADVISOR system attempts to emulate human expert performance in dipmeter interpretation. 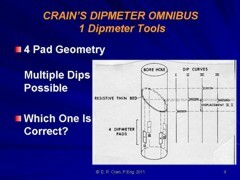 It utilizes dipmeter patterns together with local geological knowledge and measurements from other logs. It is a typical example of the class of programs that deal with what has come to be known as signal to symbol transformation. The best description of the program appears in “The Dipmeter Advisor System”, IJCAI, 1983, by Reid Smith and James Baker. - a number of production rules partitioned into several distinct sets according to function (eg., structural rules vs stratigraphic rules). - an inference engine that applies rules in a forward-chained manner, resolving conflicts by rule order. - a set of feature detection algorithms that examines both dipmeter and open hole data (eg., to detect tadpole patterns and identify lithological zones). - a menu-driven graphical user interface that provides smooth scrolling of log data. The system divides the task of dipmeter interpretation into 11 successive phases as shown below. After the system completes its analysis for a phase, it engages the human interpreter in an interactive dialogue. He can examine, delete, or modify conclusions reached by the system. He can also add his own conclusions. In addition, he can revert to earlier phases of the analysis to refer to the conclusions, or to rerun the computation. 1. initial examination: The human interpreter can view the available data and select logs for display. 2. validity check: The system compares log data with user defined criteria to find evidence of tool malfunction or incorrect processing. 3. green pattern detection: The system identifies zones in which the tadpoles have similar magnitude and azimuth. 4. structural dip analysis: The system merges and filters green patterns to determine zones of constant structural dip. *5. preliminary structural analysis: The system applies a set of rules to identify structural features (eg., faults). 6. structural pattern detection: The system examines the dipmeter data for red and blue patterns in the vicinity of structural features. *7. final structural analysis: The system applies a set of rules that combines information from previous phases to refine its conclusions about structural features (eg., strike of faults). 8. lithology analysis: The system examines the open hole data (eg., gamma ray) to determine zones of constant lithology (eg., sand and shale). *9. depositional environment analysis: The system applies a set of rules that draws conclusions about the depositional environment. For example, if told by the human interpreter that the depositional environment is marine, the system attempts to infer the water depth at the time of deposition. 10. stratigraphic pattern detection: The system examines the dipmeter data for red, blue, and green patterns in zones of known depositional environment. *11. stratigraphic analysis: The system applies a set of rules that uses information from previous phases to draw conclusions about stratigraphic features (eg., channels, fans, bars). An asterisk indicates that the phase uses production rules written on the basis of interactions with an expert interpreter. The remaining phases do use rules, but these must be specified entirely by the user. A sample screen is shown below. During the creation of these components, Schlumberger has developed a number of proprietary software tools for constructing expert systems. These include STROBE for definition of data representation, rule definition and rule integrity checking; IMPULSE for data entry to STROBE; XPLAIN for justifying and explaining rules and deductions; CRYSTAL for interactive display of data, graphics, window management on the screen, as well as task definition; and a relational data base manager. The tools are written in Interlisp-D on Xerox equipment, or Commonlisp and C on DEC VAX equipment. 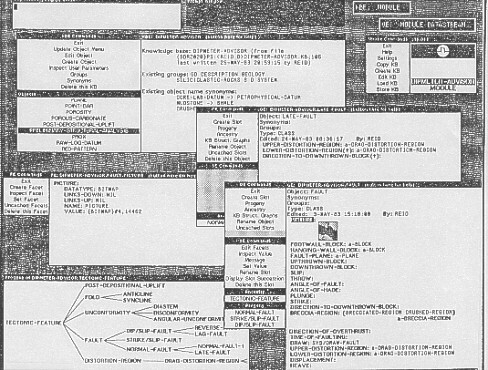 Some processing is done by a host computer which communicates with the Xerox workstation. The Dipmeter Advisor is in use within Schlumberger as a test-bed for further development and for some consulting/interpretation jobs.